• Intravenous injections are given into a vein. • Intradermal injections are administered into the skin. • Subcutaneous injections are given underneath the skin. • Intramuscular (IM) injections are given deep into a large muscle mass where the drug is absorbed slowly into the horse’s system. Intramuscular injections are the most common type used in horses and are the focus of this publication. Although a few horses are “needle shy” and object to injections, most horses quietly accept a properly given IM injection. By following the methods outlined in this circular, horse owners should be able to safely and efficiently give an IM injection to a horse. Consult Your Veterinarian. Although giving an IM injection to the horse is a routine procedure, it is not without risk to the horse. Always consult your veterinarian about the type of medication, the dosage, and the route (IM, intravenous, subcutaneous, or intradermal) before giving any drug to a horse. Improper drug handling and injection techniques can result in infections such as needle abscesses, life-threatening drug reactions such as anaphylactic (allergic) shock, and ineffective drugs or vaccines. Have your veterinarian discuss signs of drug reaction in the horse and how to handle drug reactions. Giving an injection to a horse also can pose some risk to the human handler. A horse which seriously objects to the injection can easily injure the handler. Also, some drugs used in horses can be absorbed directly through human skin or can produce severe reactions if accidentally injected into humans by needle punctures. Make sure to ask your veterinarian about any safety precautions you should take when handling a drug or giving an injection. Next check the recommended dosage. This may differ from the instructions given by your veterinarian. If you have any questions about the dosage, get clarification from your veterinarian before giving the injection. Follow the recommended method of drug storage, drug handling procedures, expiration date, and precautions. Do not mix individually packaged drugs in the same injection. Compounds in one drug preparation may inactivate or decrease the efficacy of the other drug. It is better to play it safe and give the horse two separate injections. Next, make sure you use a sterile needle and syringe. Individually packaged, disposable sterile needles and syringes are the easiest way to ensure sterile equipment. Open the packages immediately before use, and dispose of them immediately after use. Never reuse a needle because a contaminated needle can easily introduce an infection into a horse. Never use the same needle or syringe on more than one horse. Infectious diseases can be passed easily from horse to horse this way. The size of the needle depends on the medication being injected. A large-diameter needle (18 gauge) works best with thick solutions such as penicillin, while a smaller-diameter needle (20 to 21 gauge) can handle a thin, watery solution. Remember, a larger gauge number equals a smaller diameter. Larger gauge needles may break more easily than smaller gauge. If your horse reacts adversely to the injection and breaks the needle, you should make sure you can find both pieces of the needle. If you suspect a piece of needle may be retained in the horse’s muscle, consult your veterinarian. Most IM shots are given to adult horses with a 1-1⁄2 inch needle so that the medication is injected deep into the muscle mass. Foals are usually given IM injections with a 1-inch needle. The Alabama Department of Environmental Management allows disposal of needles and syringes in household trash. Collect the used needles and syringes in a hard plastic container (laundry detergent, bleach, or fabric softener bottles work well) with a screw-on cap. The container should be marked "Not for Recycling" and the cap reinforced with heavy-duty tape before disposal in household trash. Clear plastic containers or containers that typically could be recycled or returned to stores should not be used for needle disposal. Antiseptic cleansing of the injection site is not commonly practiced by most horse owners or veterinarians. They simply brush any noticeable dirt from the injection area and insert the needle into dry skin. There is no noticeable increase in infection with this method when compared with a method that uses an antiseptic cleansing agent. Studies have shown alcohol is a weak antiseptic that has very little effect on the cleanliness of the injection site. To thoroughly clean the injection site, the horse’s hair must be shaved, the area scrubbed with an antiseptic soap which must remain in concontact with the skin for at least 2 minutes, and then rinsed with alcohol. This is impractical for most horse owners and most people do not want their horse shaved at the injection site. Using a sterile needle and syringe is more important in preventing injection site infections than thoroughly cleaning the site. If you are unsure how your horse will react to the injection, it is best to untie the horse and hold its lead line or have someone else hold it. A tied horse which overreacts to the injection may pull back against the tie rope. The resulting pressure on the horse’s head may cause it to panic, injuring the horse or the handler. If the horse does pull back during the injection, simply move with the horse and continue the injection when it calms down. If the horse tries to kick, pull its head toward you. This automatically swings its rear end away from you. Some seriously needle-shy horses may need to be distracted by a twitch (a restraint device which tightly grips the horse’s upper lip and nose) or the chain end of a stallion lead run through the mouth or over the upper gum while the injection is given. The site of the IM injection is important for the safety of the horse and the handler. Choose a large muscle mass that is actively used by the horse. This promotes drug absorption and decreases the chance of swelling and pain at the injection site. The site should allow the needle to be placed deep in the muscle without danger of hitting bone, ligaments, nerves, or blood vessels. Also, the injection site should allow the handler to be in a relatively safe position if the horse objects to the injection. The base of the horse’s neck is an injection site favored by many horse handlers because it allows the handler to remain in a relatively safe area by the horse’s shoulder. This site is a triangle defined by the nuchal ligaments along the crest (top) of the horse’s neck, the cervical vertebrae which form an S-shaped curve from the horse’s poll (between its ears) toward the point of the shoulder, and the scapula (shoulderblade). 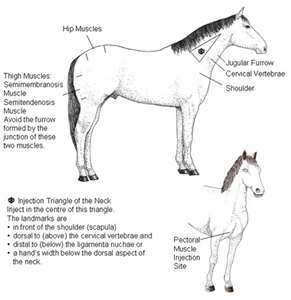 To locate the appropriate injection area, put the heel of your hand on the base of the horse’s neck where it joins the shoulder, about midway between the crest and the bottom of the neck. The area covered by your palm is the injection site. Higher toward the crest you risk hitting the nuchal ligaments, and lower toward the bottom of the neck is where the cervical vertebrae and blood vessels are located. Make sure you stay near the base of the neck rather than injecting higher up the neck toward the ears. This again avoids ligaments, bone, and blood vessels and gives a larger muscle mass for the injection. horses will kick at the person inflicting pain rather than at the painful area. You are not safe from being kicked if you stand on the left side of the horse and reach across the horse to inject its right buttock. The horse will kick at you with its left hind leg rather than kick at the site of the injection with its right hind leg. To find this injection site simply locate the bony protrusion which makes up the point of the buttocks (tuber ischii). Drop about 1 inch below the tuber ischii and inject anywhere in the large muscle mass along the back of the leg. Be sure that you are injecting into the muscle mass rather than in the crevice between the semitendinosus and the adjoining muscle mass. The pectoral muscles in the chest are another possible injection site. This site does put the handler at some risk because the handler must lean over in front of the horse to see the site clearly, putting him in a position where he could be easily bitten, stuck with a front foot, or run over by the horse. The pectoral muscles tend to become sore easily and generally are only used when the horse is receiving prolonged treatment and is sore in other injection sites. This injection site is the bunchy muscles in the lower half of the chest between the tops of the forelegs. Many horse handlers use the top of the rump (gluteal muscles) as an injection site. This is a large, frequently used muscle mass which allows the handler to stand in a relatively safe area while giving the injection. However, this injection site has some serious drawbacks and is not a recommended injection site. The disadvantage to this site is that it has very poor drainage if a needle abscess develops at the injection site. An infection at this site tends to spread up the loin and back and cannot be treated easily. However, this site can be used as a last resort for a difficult horse or a horse which is sore in all other injection sites. The proper location of this injection site is the intersection of a line between the tail head and point of hip and a line between the top of the croup and the point of the buttocks. There are several methods of giving the horse an IM injection. The method you use will depend on your experience, the injection site, and the horse’s attitude. There are a few basic rules to follow no matter which injection method you use. 1. Insert the needle perpendicular to the skin (do not slant the needle upward or downward) and sink the needle into the muscle all the way to the hub (the place where it attaches to the syringe). This ensures that the needle will not shift during the injection and that it is deep into the muscle mass. 2. Always aspirate (pull back on the plunger) before injecting the drug to ensure that you are not in a blood vessel. Some commonly used drugs can kill a horse if accidentally injected into the blood stream. If blood collects at the hub of the needle when you place it into the horse or you draw blood when you aspirate the syringe, then you must pull the needle out and redirect it before giving the injection. It is safest to pull the needle out completely and start over in a different area with a clean needle. However, if you have a needle shy horse, you can pull the needle partially out of the skin, change the injection angle, and push it back into the muscle. Many needle shy horses object to the needle going through the skin, which is the painful part of the injection, and will be relatively quiet once the needle is through the skin. Remember to aspirate again when using a clean needle or redirecting a needle to make sure you are not in a blood vessel. 3. Insert the needle quickly and decisively. A fast stab is easier for you and less painful to the horse than inserting the needle slowly into the skin. 4. Be prepared for an adverse drug reaction. Anaphylactic shock usually occurs rapidly and the horse may die within minutes. Discuss signs and proper treatment of anaphylactic shock with your veterinarian. He or she may leave epinephrine to be administered in case of anaphylactic reactions. Make sure you have the epinephrine on hand when you are giving injections. If you have to go somewhere to retrieve the epinephrine, the horse may die before you can give it the epinephrine. Observe the horse for any signs of allergic reaction for about 30 minutes after giving the injection. Usual signs of allergic reactions such as swelling around the injection site, hives, increased respiratory rate, depression, or agitation indicate that the horse may be allergic to the medication. Discontinue its use and consult your veterinarian immediately. 5. If you are giving large, repeated doses of a medication, rotate injection sites (such as left neck, right neck, left buttock, right buttock) to reduce soreness in any one area of the horse’s body. Extremely large doses (more than 15 to 20 cc) of a thick or irritating substance such as penicillin should be split into more than one injection to reduce soreness. It is also a good practice to use more than one injection site (for example, the neck and the buttocks) when giving several separate medications or vaccines at once. Then if the horse has a drug reaction it may be easier to identify the drug that caused the problem. • slowly insert the medication. Novice horse owners often worry about injecting air into the horse when the needle is inserted without the syringe attached. However, this amount of air injected into the horse is minor and will not harm it. A quiet horse may allow you to simply pop the needle into its neck or buttocks. However, if the horse needs a little distraction there are several methods of easing the needle stick. One good method is to pinch up the horse’s skin next to the injection site for a few seconds prior to inserting the needle. While holding the pinched skin, insert the needle next to the pinched area. Another method is to hold the needle between the thumb and forefinger. Tap the horse vigorously 2 to 3 times with the side of your palm in the injection site and without breaking your rhythm, rotate your hand and insert the needle. However, some horses may learn to associate the taps with the following needle stick, and leave the area prior to the needle stick. A similar method is rubbing against the direction of horse’s hair growth several times while holding the needle between the thumb and forefinger. Insert the needle on the last rub. 1. Consult your veterinarian about the type of drug needed, route of administration, dosage, drug handling precautions, and adverse drug reactions. 2. Read the drug label. 3. Use only sterile needles and syringes. 4. Untie the horse if you are not sure of its reaction. 5. Insert the needle straight into the muscle and up to the hub. 6. Attach the syringe to the needle. 7. Aspirate (pull back) on the plunger. If blood appears in the syringe, remove the needle and try again with a clean one. 8. Slowly inject the medication. 9. Observe the horse for signs of adverse drug reaction. Make sure you have epinephrine ready for injection in case of anaphylactic shock. 10. Properly dispose of your needle and syringe in a medical waste container. Cynthia A. McCall, Extension Specialist, Professor, Animal Sciences, Auburn University. For more information, call your county Extension office. Look in your telephone directory under your county’s name to find the number. © 2012 by the Alabama Cooperative Extension System. All rights reserved.